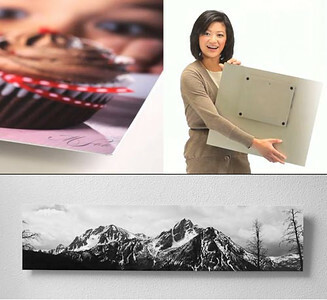 Modern printing technology offers many new and unique options for displaying a photograph. One of the more recent innovation is the ability to print photographs directly on an aluminum sheet. The image is printed on top of a white base that coats the metal resulting in a brilliant color or black and white finish. Metal prints offer a modern look with a clean, sharp edge. The image is float-mounted ¾ of an inch off the wall. With metal prints, the photo dominates the presentation with no frame or matting to distract from the pure experience of the image. Ready-to-hang metal prints are often more affordable than a traditional glass and framed print of equivalent size. Metal prints can be ordered directly through the website and are available in a semi- or stunning high-gloss finish.